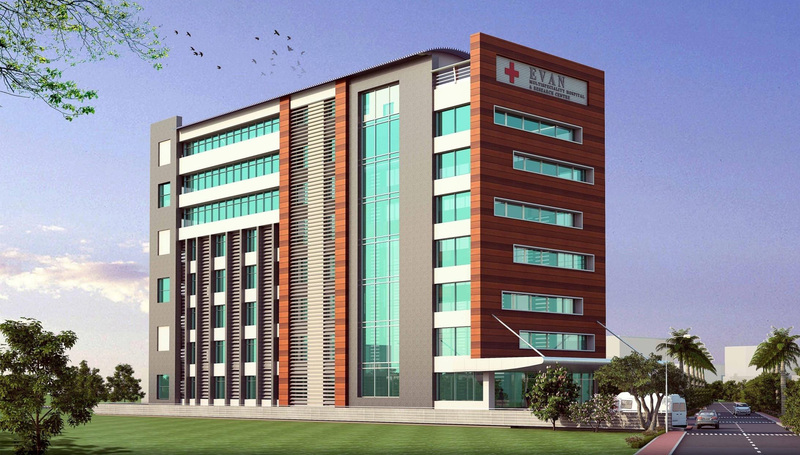 Evan Hospital is a sprawling complex with a built-up area of 80,000 sq. ft. on eight levels (B+7) and is just 1 KM from the high speed four lane expressway which connects Delhi-NCR to Dehradun, touching Meerut and Muzaffarnagar along its route and a 5- minute drive from the centre of the city. The hospital is a GREEN building, constructed in perfect coherence with internationally accepted and contemporary architecture concepts & has been specially designed as a premium healthcare and premium hospitality complex. Evan Hospital offers a range of premium rooms including, full-fledged suites, super deluxe rooms and deluxe rooms. It also houses a 24X7 trauma & emergency unit, a 36 bedded critical care unit and a fully equipped ambulance service for safe & timely transportation of critical patients.